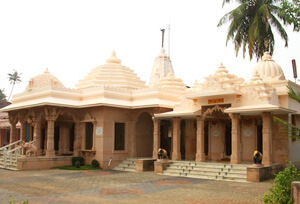 The Dharmanath temple in Kerala is one of the renowned places of Jain pilgrimages in India. Situated in the town of Mattancherry, in Kochi, in the southern state of Kerala in the Indian subcontinent, this temple attracts devout Jains from across the world every day. Jainism in the state of Kerala can be traced back to the 3rd century. This temple is dedicated to the 15th Thirthankara, Lord Dharmanath, and hence the name. The city of Mattancherry in Kochi is home to many business people from the Jain faith who had migrated to the state from their hometowns of Rajasthan and Gujarat. The entire temple and the complex surrounding the temple is impeccable in its architecture and cleanliness. The sculptures and designs of the temple are similar to those in the Mount Abu temple of Jain Dilwara. The interior of the temple is adorned with marble which has sculptures of the different Gods and Thirthankaras of the Jain faith. There are also other Jain pilgrimage sites etched into the pillars and walls of this temple in a very artistic manner. The temple is now a ‘theerth’ as it is more than 100 years old by now. The temple was renovated as part of the celebrations of attaining the much admired ‘theerth’ status. There were four more deities installed in the temple during these celebrations. The temple is situated in the quintessential Kerala setting of coconut trees and lush verdant greenery. The serenity and tranquility of the place makes it ideal for those who are meditating to attain inner peace or salvation. Right from the imposing temple gates, which have a picture of the beautiful Gajalakshmi on them, to the inner sanctorum where the idol of the Lord Dharmanath is installed, every inch of the temple is designed to create the feeling of peace and devotion in the pilgrim.